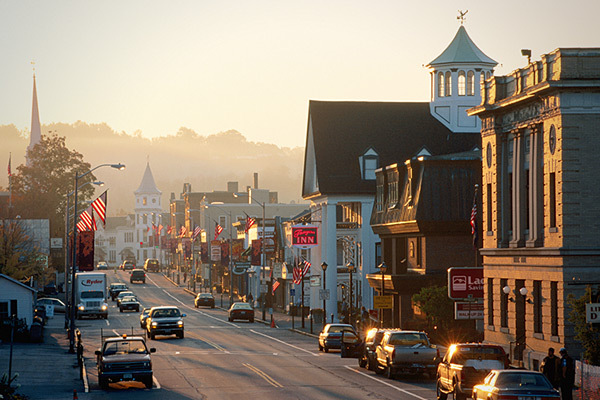 A vibrant Main Street lined with interesting shops and historic buildings, an intriguing Riverwalk, a covered pedestrian bridge over the Ammonoosuc River, and the world’s largest candy counter are just some of the delights awaiting visitors to Littleton. Littleton is a gateway community to the northern White Mountains and Great North Woods and the innumerable outdoor activities that encompass everything from hiking, rock climbing and white water rafting to fishing, snowmobiling, camping, ATVing, and bird and moose watching. With plenty of dining and lodging options, and a variety of attractions and activities that appeal to young and old, Littleton was selected in 2015 as one of the Best Small Downtowns in America by Best Choice Reviews. The community has also been named to Travel & Leisure’s America’s Greatest Main Streets list. A small selection of some of our favorite things to see and do in Littleton follows, but visit yourself and discover all of the friendly shops and points of interest that give the community its old-fashioned downtown flavor, accented with a modern, upbeat vibe. Let’s cut straight to the chase — what about that candy counter? If you’re looking to satisfy your sweet tooth, head to Chutters, the home of the Guinness Book of World Record’s Longest Candy Counter. At 112 feet, you’ll want to take your time checking out the multitude of glass jars brimming with every type of candy imaginable, over 500 sweet treats! Chutters is a NH Grand Certified Best Of Business. Northern New Hampshire has some of the best skiing around, and it’s also home since 1920 to Lahout’s, America’s Oldest Ski Shop. The 4th generation family-run business is a must-stop shopping destination for skiers, hikers and anyone who spends time in the outdoors. A delightful Main Street shop brimming with unique gift items such as soy candles, locally crafted jewelry, home décor, 603 pillows (NH’s area code), baby gifts, beer-flavored soap, including one for your favorite four-legged friends, and a variety of wines. The shop is known for its great selection of bikes and biking accessories for everyone from tykes to the high-end cyclist, along with indoor fitness equipment and stand up paddleboards. Bike rentals include road, mountain, hybrid, and fat bikes. SUPs and snowshoes are available for rental, too. Any day is a good day to visit a bookstore, but rainy days in particular lend themselves to browsing and lingering. Little Village Toy & Book Shop is stocked with a wide selection of kids’ books and inspiring and educational toys, complemented by a good variety of adult fiction, non-fiction and local reads. The League of New Hampshire Craftsmen’s colorful and eclectic gallery showcases some of New Hampshire’s finest craftsmen working in jewelry, clay, glass, fibers, wood, metal, photography, baskets, printmaking and mixed media. The gallery’s Studio School offers hands-on workshops and classes in pottery, jewelry making, basketry, painting, and more. When you want to feather your nest or treat your BFF with a little something special, browse the collection of distinctive gift items and home décor at Nest of Littleton. Bedding, linens, dinnerware, candles, jewelry, handbags and much more. Don’t miss the art gallery and silk flower arrangements on the river level. A favorite destination for quilting aficionados, One Stitch, Two Stitch carries hundreds of fabrics, including hand-dyed batiks, contemporary and seasonal designs, jelly rolls, charm packs, patterns and quilting supplies. Check out the class schedule and brush up on your quilting skills or just drop in to browse and visit. Looking for the best in mid-century modern décor? Just L has assembled a collection of furniture, lighting, barware, vintage textiles and plenty of other intriguing items to whet your appetite. Eclectic, whimsical and unique! Everything music under one roof, from guitars and amplifiers to percussion instruments and accessories. A family-owned business for over 40 years, Northern Lights was named #3 Top Santa Cruz Guitar Dealer of 2016. And if you find a guitar you like while on vacation, Northern Lights will ship it home for you, free of charge! Wind chimes, garden statuary, candles and incense rub shoulders with colorful and comfortable clothing, crystals and a fine selection of jewelry at Aylakai. A delightful boutique situated in an 1884 Victorian on the banks of the Ammonoosuc River, and filled to the brim with an amazing assortment of jewelry, hair accessories, candles, stationery and unique gift items. Stroll down Main Street and you just might hear a piano playing! A handful of colorfully decorated pianos are situated along the thoroughfare, inviting both the experienced player and novice to sit down and tinkle out a tune! Littleton is known as the “Glad!” town and for good reason. It’s the hometown of Eleanor H. Porter, author of the beloved children’s book “Pollyanna.” Pollyanna was known for her exceptional optimism, and that positive spirit is memorialized in a cheerful statue on the Littleton Library front lawn, making for a wonderful photo op! If you’re visiting Littleton during the warm weather months, look for Main Street’s two arched gateways festooned with colorful floating umbrellas to guide you to Mill Street and the town’s lovely Riverwalk along the banks of the Ammonoosuc River. Stroll the footpath along the river, and make a stop at Harmony Park and the outdoor musical instruments (a great kid magnet!). Providing expansive views of the Ammonoosuc River, the 352-foot Warren Truss covered bridge connects to walking trails on both sides of the river. Grab a craft draft beer and a burger (just $11) on Thursday nights at The Beal House Inn or order from a menu that includes locally raised pork and local greens. The Inn’s six guest rooms are charmingly furnished and its location right on West Main Street makes it an easy stroll to downtown attractions. Small batch brews and Neapolitan-style, wood-fired pizza pies, served in an 18th century gristmill on the Ammonoosuc River. Weather permitting, snag a seat in the beer garden or the riverfront deck. Who doesn’t love a diner meal? You’re in luck because The Littleton Diner is one of the best. Well-known for its home-cooked foods, generous portions and friendly staff, The Littleton Diner is a perennial favorite of locals and visitors. Open for lunch and dinner, the Café’s menu of traditional Thai cuisine will satisfy diners with its amazing variety of familiar Thai dishes, prepared with fresh herbs and other ingredients. The Thayers Inn has been welcoming guests since 1850 and is the oldest continuously operating hotel in the White Mountains. Climb to the cupola atop the hotel for great views of downtown and the surrounding mountains. The on-site restaurant and tavern, Grille One-Eleven, is open for lunch and dinner, with both a regular and lighter fare menu. Martini lovers will go gaga over the more than 80 martini selections at Bailiwicks. Pair your favorite or a new combo with the fine selection of dishes on the restaurant’s lunch and dinner menus. Summertime deck seating. Looking for a hearty and satisfying breakfast? Try The Coffee Pot Restaurant where the coffee’s always on, the food is always homemade and home-baked, and the service is excellent. Great lunches, too. Walk in the door at French Sisters and it’s hard to decide. Should you blow your diet and order a slice of one of the incredible cakes or perhaps a pastry (chocolate cream puffs to die for! ), or stick to healthier fare and enjoy soup and a sandwich? Oh, what the heck. It’s vacation time, and you’ll walk off the extra calories exploring downtown. You can’t beat the excellent selection of meats, seafood, cheeses, produce, wines and grocery items at this cooperatively owned supermarket, where an amazing number of items are locally sourced. With its expansion in 2017, the Co-op has added a cafeteria where you can enjoy freshly prepared salads, sandwiches and soups in a casual and relaxed atmosphere. The store even has an electric car charging station. Alburritos brings Mexican food to Littleton, NH with tons of flavor and just as much excitement. With Mexican cuisine ranging from tacos to burritos to ensaladas galore, Alburritos asks you to put them to the test to see if there isn’t something for you! Don’t like spicy? No problemo! Vegetarian or Vegan? They’ve got you covered. Just not sure? Have no worries. If you’re looking for a taste of south of the border, check out Alburritos the next time you’re in Littleton. A must-stop for ice cream lovers. Creamy scoops, delicious flavors — try the signature Bishop’s Bash — and an ice-cream parlor atmosphere make Bishop’s a welcome stop on a summer afternoon. The owners of The InkWell in Littleton want it to be more than just a place to grab an exceptional coffee or tea. They want their coffee house to be your coffee home. Here’s the backstory. INK: A little known word for coffee. Coined in 1582 by a German physician who, while traveling in Aleppo, was served the dark brew and described the foreign liquid as “black as ink.” An active WELL, dating back to Bible days, was paramount to a town’s survival. It was the epicenter of the community. The daily well run was a gathering place, not unlike today’s pubs or local coffee shops. Fast forward to 1988, on a starlit evening in June. Jim, recently home from the mission field of Sri Lanka, asked Angel on a first date. It was then they fell in love over a piping hot cappuccino at a funky coffee house in NJ called The Ink Well. The Jersey Ink Well is going as strong today as its humble beginnings in the 60’s. And for those of us living in the pristine White Mountains, the couple seeks to build a similar legacy. A place to connect, to unwind, relax, get inspired, to feel the welcome, to simply be. And if you happen to find love while sipping a cappuccino … well, they’d understand completely! Part of the Little Village Toy & Book Store, the Blue Jay Coffee & Tea Bar is a great place to unwind and relax while sipping on a delicious cup of tea or coffee while perusing the book store shelves. In addition they have a variety of light fares to choose from including Avocado Toast, BLTs, farm fresh salads and more!